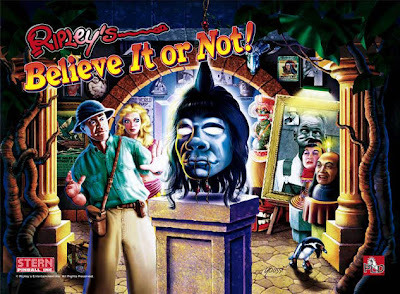 Newport Oregon is home to the Ripley’s Believe It or Not! Museum. They have recently changed the lobby to showcase a Sasquatch and wanted us to share it with our fans. Since Robert Ripley’s first cartoon strip in 1918, Ripley’s has been collecting oddities from around the world, featured in books, fairs and Ripley’s famous Odditoriums. You can experience all the wonder of the world’s most bizarre sights right here in Newport, from the “live” stageshow to shrunken heads to the magic harp. And be careful not to step over the edge of the universe in the deep-space hall of mirrors. A contest for a three-day Bigfoot expedition in Florida, backed by Ripley's believe or not!, Haunted Attraction Magazine and Shadows in the Dark Internet Radio? I can't think of anything better. Go quick to fill out the contest form here. For more details expand the full post to read the press release. 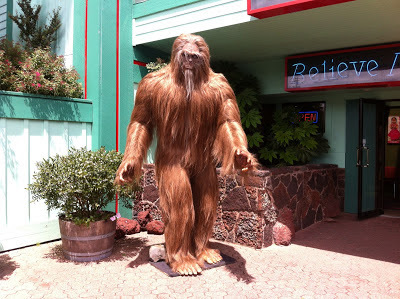 (1888PressRelease) March 24, 2009 - Internet talk show Shadows in the Dark will giving away a Bigfoot Expedition and Cast during 24 Hour Anniversary Bash with Ripley’s Believe It or Not! On April 18th, 2009 Shadows in the Dark in association with Ripley’s Believe It or Not! will be hosting its 24 Hour Anniversary Bash Presented by Haunted Attraction Magazine. The event is set to take place at the Ripley’s Museum in St. Augustine, FL at the stroke of midnight on April 17th and lasting until midnight on the 18th. The Bigfoot, or Swamp Ape, Expedition will consist of a three-day practicum of conference sessions and field research involving multi-media resources, discussion and practical experience. 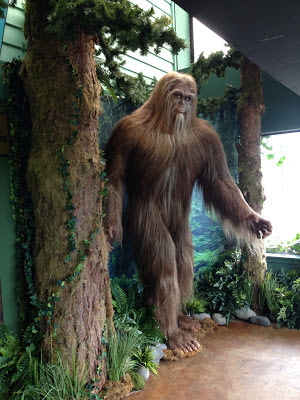 The practicum will be moderated by an instructor from the Pangea Academy and include a multi-media presentation of research in cryptozoology focusing on a particular species of cryptid animal. The orientation will be followed by a lecture and discussion session lead by the speakers who have field expertise with the subject animal. Field research expeditions will be held daily. Expedition will take place in Florida and winner will have the choice of a Spring or Fall Expedition. Winner will also be responsible for travel expenses, camping supplies and food. You are required to fill out a brief survey to enter the drawing which can be done online or at the event. For more information you can visit the 24 Hour Anniversary Bash website at www.shadows24.com. The event is also sponsored by Dark Side Ink, Ed Boudreaux’s Bayou Bar-B-Que, Website Needs, and Days Inn Historic St. Augustine. About Shadows in the Dark – Shadows in the Dark is an internet based talk show hosted by Jeremiah Greer that discusses a variety of topics with a focus on the strange and unusual. They have been broadcasting for 2 years and can be heard on Thursdays and Sundays at 9:30pm ET at www.shadowsinthedarkradio.com.